Menu bar - open, save and print images; manipulate images and overlays; navigate through previously-viewed images; open on-line image, target catalogue and archive servers (including name resolution); open personal catalogues. See a detailed description of the menu bar functions. Toolbar - open stored images; navigate through previously-viewed images (also in the menu bar, see a description of the Go menu for history navigation info), change the display stretch, access the catalog viewer, and search for guidestars and download images. See a detailed description of the toolbar buttons. Position editor buttons - display or move the base position or instrument angle; display, add, move or delete WFS star or offset positions; display the WFS and science instrument fields of view and mosaic patterns; display guide star and on-line catalogue sources. See a detailed description of the position editor buttons. 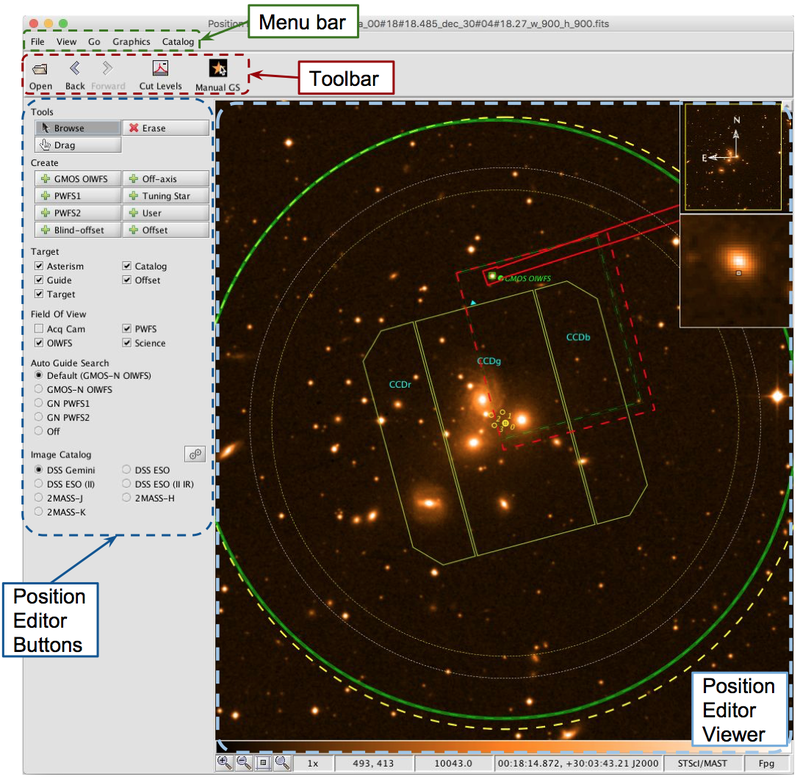 Position editor viewer - display an (optional) image of the field around the science target and overlay instrument, WFS and catalogue information. Any FITS image that contains a suitable world coordinate system may be used as the background image (see more details about the viewer). The viewer image (with or without overlays) can be printed or saved to disk (from the file and catalog items on the menu bar).